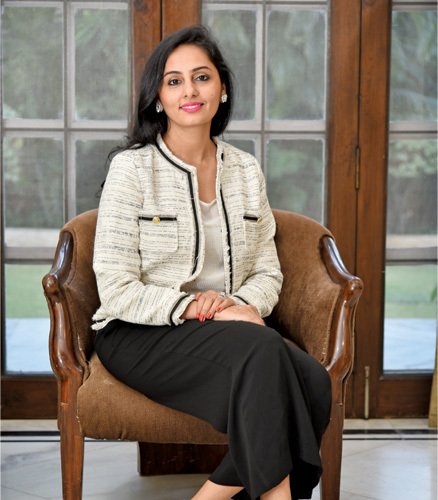 A passionate, creatively astute young lady, Priyanka Agarwal Melwani co-founded Sarafa, a jewellery customisation brand that creates artistic pieces of jewellery in Hyderabad. Drawing inspiration from her travels, she channels all that energy into crafting one-of-a-kind pieces that instantly grab eyeballs. Although she began her creative journey with Sarafa, she extended her expertise two years ago by managing events décor which, she says, has been “a roller coaster ride” so far. Since both fields demand creativity and consistency, it’s helped Priyanka to push boundaries and further excel at everything she takes up. Here she gets talking about jewellery, in particular, syncing with the theme of our issue! I’ve always wanted to get into a field that demands one’s creativity. During my final year of graduation, while deciding whether to choose a course in fashion or jewellery design, I was leaning towards fashion, as it seemed like the easier choice (and frankly, everyone was taking up fashion design at the time). However, it was my father who steered me in the direction of jewellery design, as he felt it was more suitable for me in the long run. Once I started my education in jewellery design, it all fell into place. I’ve also taught jewellery design for over six years, and it’s been an incredible journey so far. How did Sarafa take shape? It started 15-16 years ago, when I met my partner Sangeeta Gupta while we were participating in a play on the modern Ramayana. After we talked about our interests, one thing led to another, and Sarafa was born. Who has been your best muse so far? It’s my mother, who has been a constant driving force in my life. She stood by me and encouraged me through all my growing years. She has really been the fountainhead of advice for me. Do you feel you need to do more, since there is no brick-and-mortar store for your brand? Currently, we have our hands full with clients, both old and new. We are also planning to cross borders and partake in jewellery exhibitions across India, where we can showcase our designs to a larger audience. I realised that routine and habit can suppress creativity. One of the primary reasons we are into jewellery customisation is because it always keeps us on our toes! Challenges in designing have always brought out the best in us, and pushed us out of our comfort zones. Do you wear a lot of jewellery yourself? What type of jewellery is your favourite? My own jewellery selection is purely based on the occasion. While I don’t go overboard, I do love wearing well-designed jewellery. As far as my favourite is concerned, I prefer uncut diamonds. I feel they add beauty not only to Indian wear but, if worn well, to western outfits too. How do you strike a balance between creativity and functionality in your jewellery? This has always been a bone of contention for both my partner and I. There are times when we want to add creativity to our designs, but get restricted because we aren’t sure if it will work from a selling point of view. Sometimes a client allows us to go all out on the design aspect, but then there are also times when we are restricted by budgets. Somehow we’ve managed to strike a balance between functionality and design, throughout the years.